Jeremy A Johnson | One Man's View. Infinite Possibilities. One Man's View. Infinite Possibilities. I’ve had an ongoing curiosity about the impact of diet, exercise, and sleep on my mood and energy level. 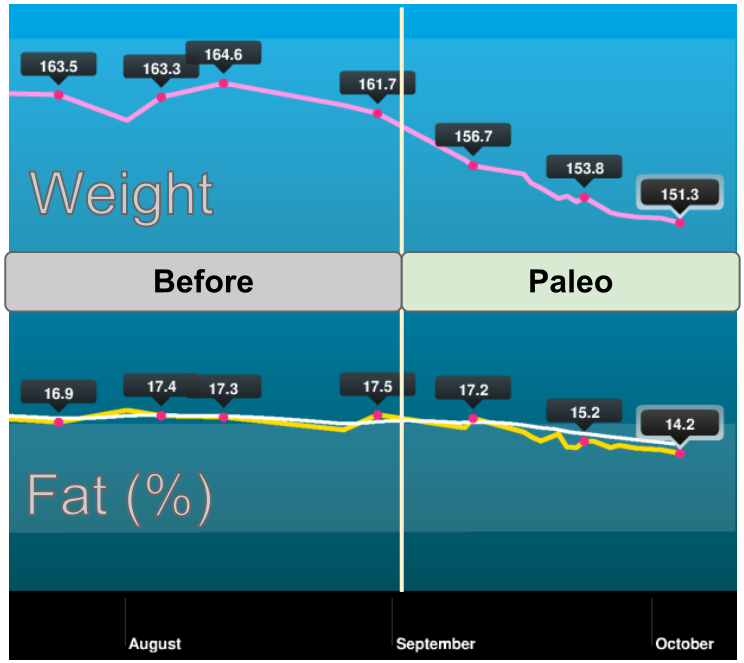 I first heard of the Paleo diet a few years ago when I was attending Quantified Self and similar meetups. Browsing through the Everyday Paleo cookbook at Costco reminded me of the diet and triggered my decision to run a 30-day self experiment. Eating a Paleo diet for 30 days will improve my mood. Beginning September 2nd, I began eating a Paleo diet. Most of my meals were home cooked recipes from the Everyday Paleo cookbook. When eating out, I did my best to choose Paleo-friendly menu items. I measured my mood on Moodscope. Prior to the experiment I measured my mood every 2-6 days. During the experiment I measured my mood every day, typically in the evening after dinner. I periodically weighed myself on the Withings scale first thing in the morning. My baseline mood improved from roughly 35% to 55%. In addition, the variation in my mood has significantly decreased. My weight has dropped from 163 lbs. to 151 lbs. and my body fat has dropped from 17% to 14%. Today, my dental hygienist told me that my gums looked really healthy—not puffy like they have in previous visits. My wedding ring is much looser. In Everyday Paleo, the author recommended trying the Paleo diet for 30 days and then deciding whether to continue eating Paleo if you feel more alive and energetic. If not, you can always go back to eating the way you were before. Well, there’s no question that I feel better. I’m especially glad that I diligently measured my mood every day—looking at the graph is much more compelling than simply explaining how I remember feeling. Unlike many individuals that try diets, my goal had nothing to do with weight loss—losing a little weight (and body fat) was a pleasant surprise. What surprises me is that I have lost weight simply by changing what I eat, not how much I eat. Not once during the 30 days did I withhold myself from eating as much as a wanted. While I’m absolutely satisfied with the results, I will admit that this required an extraordinary amount of effort and will power. Since this was my idea, I took on the responsibility of cooking for the entire month (typically my wife and I alternate cooking every week). Rather than eating a bowl of cereal and yogurt every morning, I would make something on the weekends that I could warm up during the week, such as a frittata and gluten-free muffins. Eating out was also a challenge. I’m very fortunate to live in San Francisco where many restaurants are known for serving fresh, local ingredients. After completing this 30-day experiment, I’m convinced that eating a Paleo diet is healthier and significantly improves my mood. The challenge I now face is deciding how much effort to invest in continuing to eat Paleo. The question I ask myself is, why did this work? More specifically, what food did I eliminate from my diet that has the most impact? Was it the dairy? Gluten? Legumes? Sugar? Or was it that the foods that took the place of these ingredients were simply more nutrient dense? Or could this all be placebo effect? I plan to continue to eating Paleo when I have the choice. When I make exceptions, I’ll see how I feel and start deciding what foods I need to avoid. I want to make it as easy as possible for an individual to identify the smallest behavioral change with the greatest potential to improve a health metric that she cares most about. I am working on clarifying my vision for how to do this and will follow up in another blog post. Are you planning to migrate from licensed (installed/download) versions of Atlassian products to OnDemand? Here are some useful resources to help your migration go smoothly. Check that you have enabled FishEye application access. You’ll need this in order to upload your JIRA dump file via WebDAV. Use cadaver for uploading your JIRA dump via WebDAV. Migrating from our own Subversion repository to FishEye was the most challenging; perhaps because the migration is from a non-Atlassian product. Before exporting your Subversion repository, make sure that you have a top-level directory for every JIRA project. This is required for the import. Note that the project name is case-sensitive and must match the project key. Additionally, each project directory must contain three directories: branches, tags, and trunk. For detailed instructions, see Importing Versioned Data into Subversion. If you need to rename one of your Subversion top-level directories to match your OnDemand project key, check out the handy tool svn-dump-reloc. After completing the import, grant access to the top-level directory. Without performing this step, we were unable to create or delete branches. See Configuring repository permissions for a project. OnDemand does not allow hooks on the repository. If you are post-commit hooks on your existing repository, you’ll need to workaround the issue by creating a Subversion mirror and executing the hooks from this mirror. See the instructions for this workaround in this comment. If you want to learn more, come check out my talk at the 2012 Atlassian Summit in San Francisco. Thanks to Allan Carhart and Jan-Michael Ong for doing all the heavy lifting during the migration! Update: a video of my presentation is now live. Anyone other salesforce.com users also using Wedshare for wedding RSVPs? I wanted reporting capabilities beyond what wedshare.com had to offer, and decided to move data between my wedshare and salesforce.com accounts. I’d be happy to share the code with anyone else looking to do the same. In a recent email conversation with a friend in med school I was once again reminded of the enormous unrealized potential of hospital IT systems (primarily EMRs). Plenty of other authors and bloggers have described the politics, regulation, and lack of incentives on behalf of the major EMR companies that I believe have led to the current situation. Rather than explain why this gap exists, I’ll just let this anecdote and perspective speak for itself. This is the kind of stuff that energizes the innovator/entrepreneur in me. Right now all the EMR’s are pretty terrible. It is a constant battle to try and either get your patient’s on the right meds or keep them off the wrong meds. Between all the residents, specialists, and different doctors that interact with a patient on a given day, one is bound to put them on a med that is contraindicated. It happens every day. Just tonight, I happened to be right next to the nurse as she took a call from the resident on call for a patient that was in liver failure and was requesting pain medication. The resident told her to put him on Vicodin which has tylenol in it and is toxic for the liver. I just happened to be standing there and told her not to do that. But this stuff happens all the time, and I just happened to be around the patient. The night before he was put on another liver toxic med by another doctor. The whole system relies on people being right rather than a system of fail safes or an effective patient management system. The EMR systems are just storage systems, they don’t have any smart features to them, which is such a shame, because we have all of this great information, but somehow medicine hasn’t found a way to organize it effectively. Unfortunately, diagnoses get missed all the time, when the blood work screams the answer, but it is just missed by us. Someone has to be working on this, right? I certainly don’t have a solution for this, but I continue to find it an interesting question. I am interested in hearing your experience with the unmet potential of IT systems in hospitals. Also, who do you consider to be the most effective leader of change in this field? Learn all about a process for innovating medical technologies that was formerly limited to fellows and students in Stanford's Biodesign Program. I’m excited to be receiving a copy of the Biodesign book this Wednesday. When I learned this process in the driver’s seat as a fellow in the program, the only written material to reference was a collection of detailed notes written by a previous year’s fellow. Our primary guides in learning this process for innovating medical technologies were the co-founders of the program, Josh Makower and Paul Yock. I feel fortunate to have had the opportunity to learn directly from these two physician-innovators. I also recognize that this teaching model is limited in its scalability. Now that the process is explained in writing and available on Amazon’s bookshelf, anyone can glean the valuable lessons and advice for less than the price of taking any single author out to dinner! Since Stanford’s Biodesign Program continues to evolve year-after-year, I’m also looking forward to the new lessons, case studies, and process guidelines that have developed since I completed the fellowship 5 years ago. Biodesign: The Process of Innovating Medical Technologies, is now available in the U.S. This is a comprehensive and hands-on guide to medical device innovation – over 700 pages – that provides practical information on important topics such as needs finding and characterization; ideation and brainstorming; IP, regulatory and reimbursement strategies; global opportunities; and funding and marketing approaches. The book also includes quotes, case studies, and vignettes from hundreds of innovators and companies from the Bay Area and beyond. Women: did you know that breast cancer isn’t your greatest enemy? Click to visit Abbott's foryourheart.com website. Do you know the #1 cause of death of women? Turns out that it’s not breast cancer—that’s just the disease that receives the most publicity. I, too, was surprised when I first heard that the #1 killer is heart failure. I first heard this at a heart failure conference last year; it wasn’t until today that I saw the first sign of public awareness. On my drive up US-101 towards San Francisco today, I was delighted to see a billboard making this point loud and clear, and directing drivers to the site foryourheart.com. This Abbott-sponsored site lays out the facts in one page and provides readers with Personal Stories, Symptoms, Risk Factors, and other Resources. Check it out. I just finished watching Clayton Christensen’s lecture, The Innovator’s Prescription: A Disruptive Solution to the Healthcare Crisis. Even though I don’t have the time to write all my takeaways and where I’ve seen evidence of his model in my own personal and professional experience with the healthcare system, I felt compelled to share this nonetheless. Looking forward to reading the book!